J S Bach was a German composer and keyboard player. During his lifetime Bach was chiefly known for his masterful organ and harpsichord playing; his great genius as a composer was only really discovered in the 19th century. 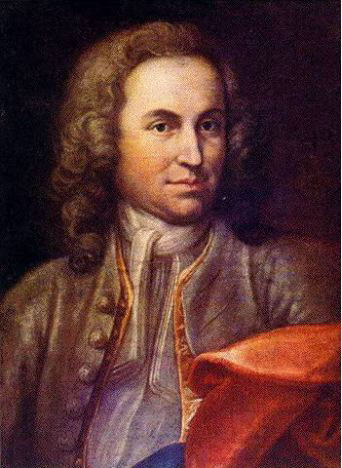 Bach wrote organ music, including choral preludes, preludes, fugues, and toccatas; orchestral and chamber works, including the Brandenburg Concertos; and church music, including the St Matthew Passion. Noteworthy among the collections of his keyboard works The Well-Tempered Clavier and The Goldberg Variations. 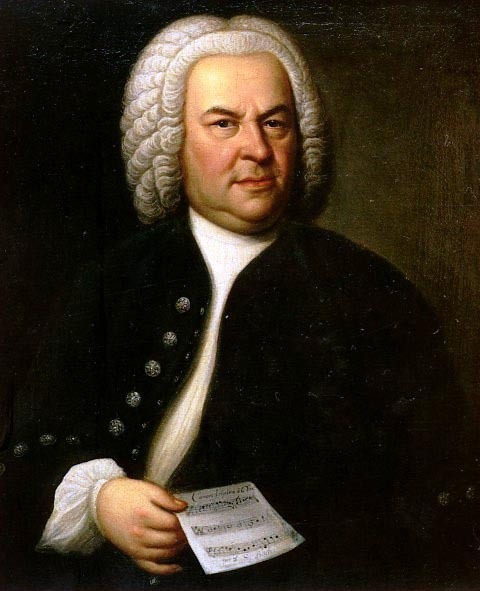 Portrait of Johann Sebastian Bach in his old age. 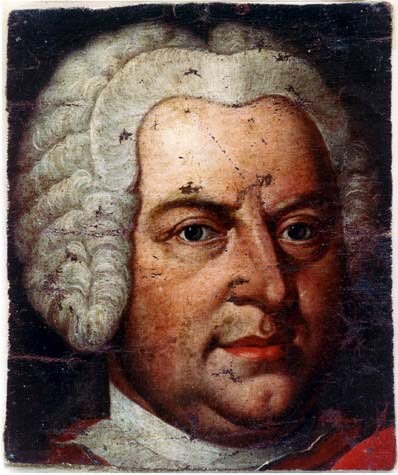 The above image is a 1748 copy of the 1746 portrait of Bach (aged 61) by Elias Gottlob Haussmann. This copy is privately owned and is located in the William H. Scheide, Princeton, New Jersey, United States. The original 1746 painting hangs in the Altes Rathaus (Old Town Hall), Leipzig, Germany. Johann Sebastian Bach as Konzertmeister in 1715. This painting, entitled Young Johann Sebastian Bach, was painted in 1715 by J. E. Rentsch, the Elder (d. 1723). Some art historians, such as Teri Noel Towe, have argued that this portrait is probably not of Bach. Johann Sebastian Bach, c. 1733. The above image is the Weydenhammer Portrait Fragment, a fragment of a Bach portrait that once belonged to Johann Christian Kittel, one of Bach students. The artist is unknown. A discussion by Teri Noel Towe of this portrait's probable authenticity and origin may be found here. 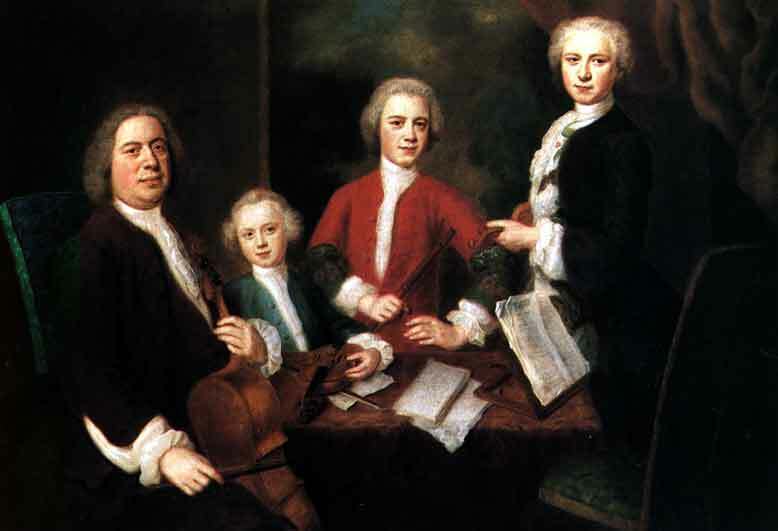 J. S. Bach (left) with three of his sons. The artist and the date of this painting are unknown. 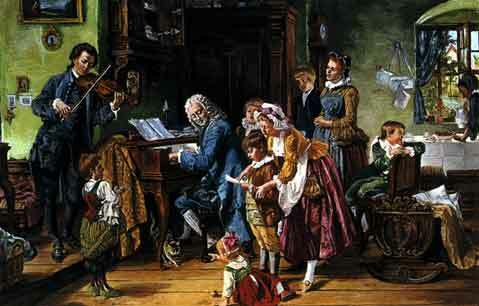 The Bach family at morning music practice. Bach is at the keyboard and the other family members are playing or singing. This image comes from a popular 19th century print by an unknown artist. 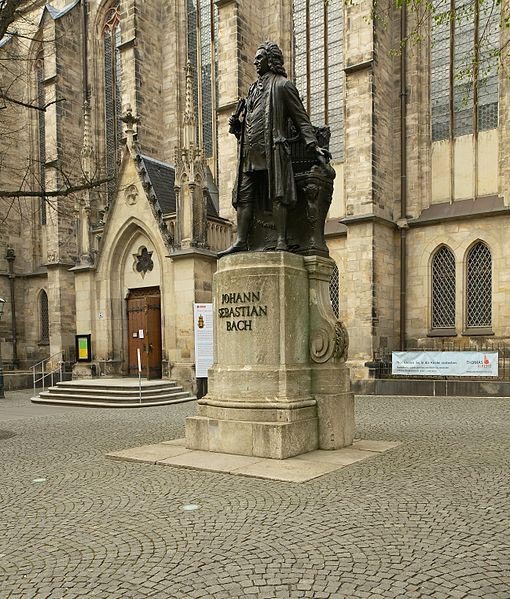 The memorial statue of Johann Sebastian Bach in front of Thomaskirche [St. Thomas Church] in Leipzig, Saxony, Germany. In 1723 Bach was appointed Cantor of the Thomasschule (St. Thomas School] in the Thomaskirche. In his role as Cantor Bach was required to teach singing to the Thomasschule's students and provide music for Leipzig's main churches. He held this post for 27 years until his death. Signature of Johann Sebastian Bach. The front page of the Violin Sonata No. 1 in G minor (BWV 1001) by Johann Sebastian Bach. This music score is an "autograph" (that is, is written in Bach's own handwriting). Bach's Lute Suite in G Minor (BWV 995). 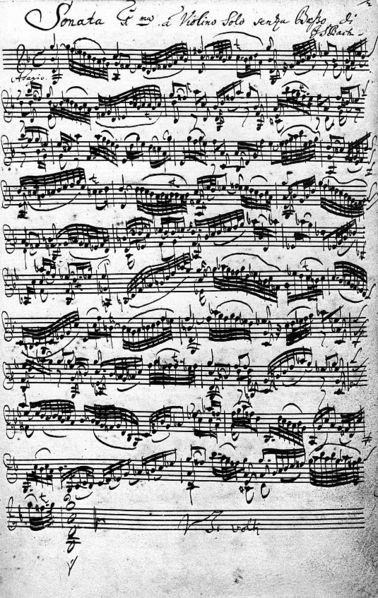 This is the first page of the score and it is written in Bach's own handwriting. This postage stamp was issued by Germany in 1971 to commemorate 250th anniversary since Bach composed his Brandenburg Concertos in 1721. 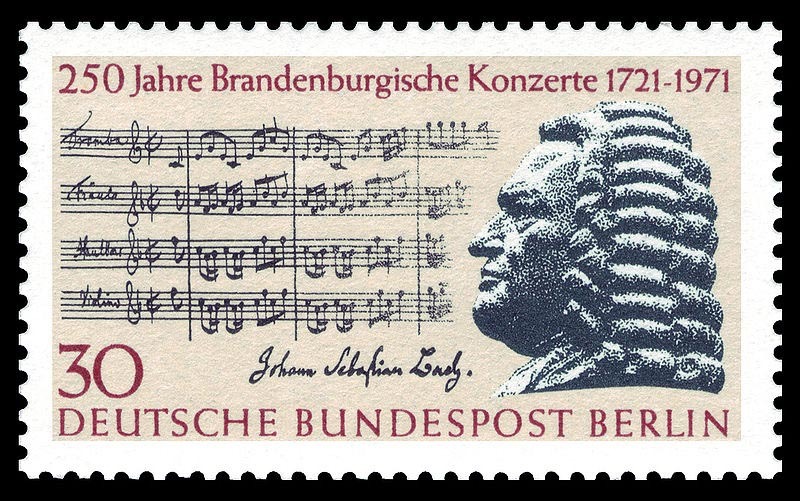 Shown on the stamp is an excerpt from the original score for the Brandenburg Concerto No. 2 and the bust of the composer (by a sculptor who has not yet been identified). 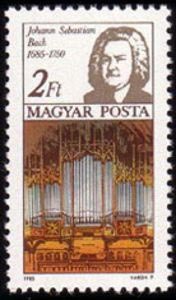 Johann Sebastian Bach and one of the organs that he used to play are depicted on this postage stamp issued by Hungary in 1985 to commemorate 300th anniversary of the composer's year of birth. Johann Sebastian Bach and George Friedrich Handel are shown by this pair of stamps issued by the German Democratic Republic in 1985. These two composers were both born in the same year (1685) and these stamps were issued to commemorate the 300th anniversary of the year of birth. 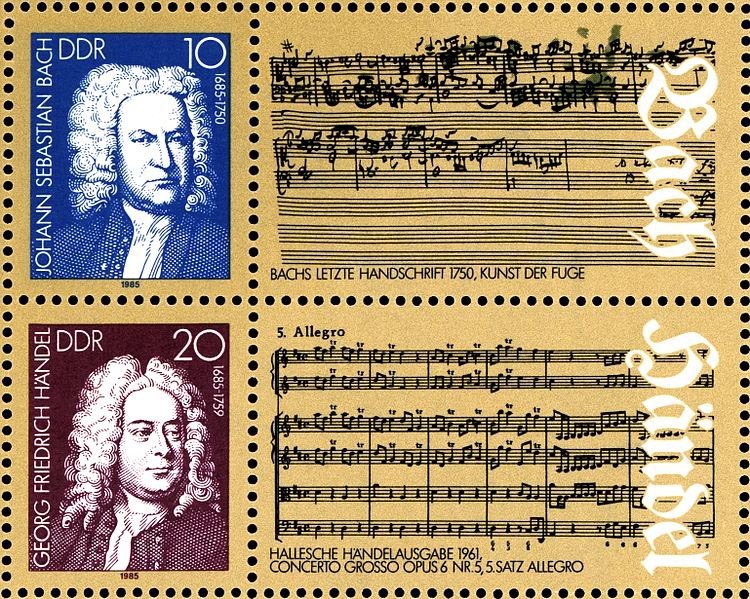 The top stamp depicts Bach along with an excerpt of the original manuscript for Kunst der Fuge (Art of the Fugue) (1750). This work of music was written shortly before the composer's death and the above excerpt contains, as the stamp notes, "Bach's last handwriting". 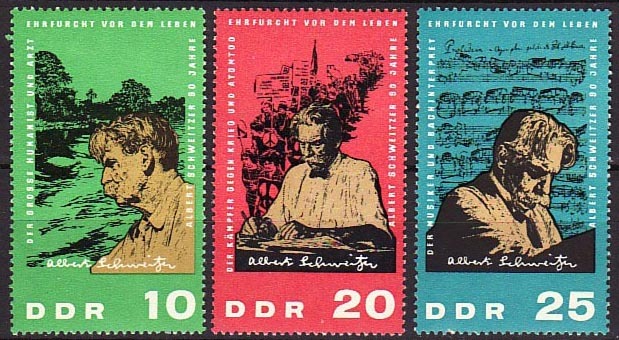 This series of three postage stamps was issued in 1965 to celebrate the 90th birthday of the great medical missionary, humanitarian and organist, Dr. Albert Schweitzer. The blue stamp (on the right) depicts Schweitzer as a musician and a renowned interpreter of the works of Johann Sebastian Bach (which are shown in the stamp behind an image of Schweitzer at the organ keyboard). The green stamp (on the left) shows Schweitzer as a great humanitarian and doctor (the background image shows the Ogooue River at Lambarene, French Equatorial Africa [now Gabon] where he ran the Paris Missionary Society's mission). The red stamp shows him as a fighter against war and the atom bomb (the background image shows one of the street marches of the 1960s protesting against atomic warfare). Note: This picture gallery page includes drawings, paintings, photos and images of Johann Sebastian Bach, his music, activities, friends and family, and the various places where the composer lived and wrote.